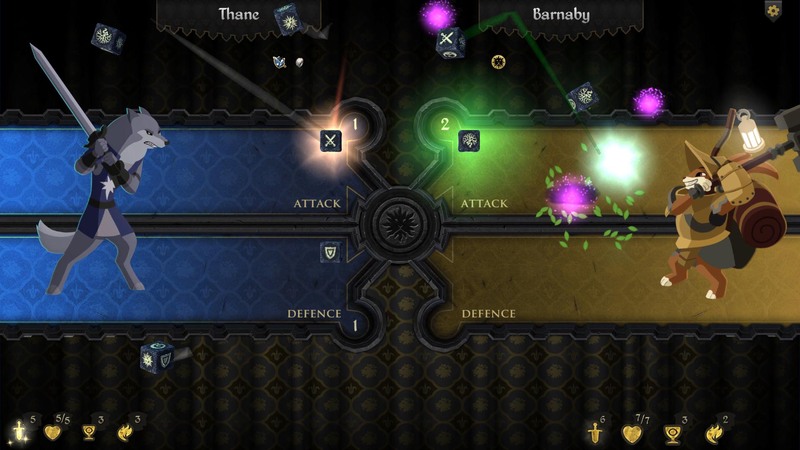 Armello is a virtual board game that combines card strategy and role-playing elements. It takes a strong will, patience, and cunning to get ahead. See how well well our bunny clan fares in our review. Armello takes elements from tabletop board games, strategy card games, and role-playing to form one exceptionally deep and challenging strategy game. 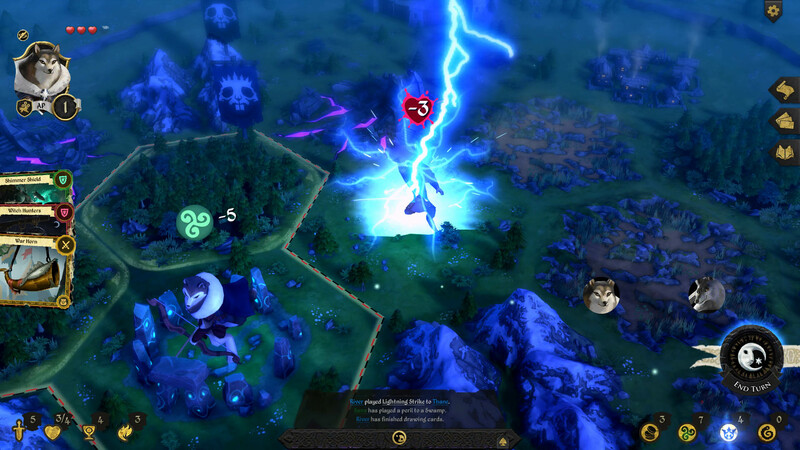 You might not be able to tell at first glance, given the bright cartoon graphics and cute anthropomorphic characters, but Armello tells a dark story that puts skills to the test. The king of Armello is stricken with a corrupting sickness called Rot. While the sickness gradually kills him, he'll first be driven to madness, and will summon demons called Banes to cause chaos across the land. Although this might be bad news for the kingdom, this is a cue for an adventurer from one of the four different animal clans to rise up and take his place. Each character has a unique set of abilities, but they don't necessarily lean toward any one victory condition. Winning mostly entails gathering enough strength to defeat the King in a straight fight, but there are more subtle paths to victory. You could gain a huge amount of Prestige through taking over towns, completing quests, and killing other heroes. Then, it's a matter of waiting things out until the King dies from his illness or if a hero dies in the process of killing him. Darker approaches include corrupting yourself with evil magic and then taking the King's place as the lord of darkness. Or you can choose the light by collecting enough spirit stones to cleanse the King of corruption. Whatever path you choose, there will be huge roadblocks involved. The board is relatively small and has different terrain types, so heroes really have to fight over control of towns. Getting around can be tough, especially when there's a town that's heavily contested. When playing against the computer, there's always at least one character that goes out of its way to attack everyone it comes across. I usually considered myself lucky to make it more than five moves past my starting point without someone trying to kill me. Oftentimes, I couldn't figure out why the computer had it out for me, especially when I wasn't the most powerful character on the board. In addition to the variety of spells and traps players can use to screw each other over, there are also royal decrees. The player with the most Prestige chooses which of two decrees gets passed. It's a decision that usually involves picking the lesser of two evils, like putting a bounty on everyone (including the player making the choice), but some can give the player an advantage. However, there are a few decrees that single out and hurt the player with the most Prestige, which is a little boggling. Why would anyone select it? It's better to hurt everyone than to suffer alone. Combat has as much to do with luck as it does skill. Each character is allowed a number of dice to roll. Rolls translate into hits, blocks, and misses. Those with more dice in hand have the advantage. Some characters have a strong disposition toward fighting, although players can turn the odds toward their favor by picking up equipment and using cards to lay traps and cast spells. Additionally, players have the option to sacrifice some of the cards in their hands to tip the scales. Things really start to heat up as the game progresses. Soon, Banes are wandering every corner of the map, attacking players and taking their towns away. Players have to divide their attention between defending against each other, Banes, and playing toward winning. Eventually, someone has to step up to try to take the King down, which is no easy task, even for powerful characters - thanks to the dice based combat system. Despite my frequent cursing when a roll doesn't go my way, or when an opponent suddenly decides to ambush me, I never felt that the game was unfair. The virtual dice always appeared to have a nice random spread that didn't favor any one player or the computer. It's difficult to plan a strategy with this degree of uncertainty, but that's part of the game's challenge and charm. I had to remain flexible with my approach, and changed my strategy when necessary. However, it would be nice if there were some means to get rid of cards outside of combat. I rarely have any interest in embracing the dark side by playing corruption spells. In a similar vein, I would sometimes end up with spell cards with a really high mana cost that I have almost no hope of using. Additionally, I don't really see the point in cards that only benefit other players, since Armello isn't a game that fosters alliances. Games generally last for about 20-30 minutes, depending on how well (or poorly) players do. The intensity ramps up very quickly, which is crazy, because no game that's this cute should be this stressful. Playing is both a joy and infuriating, depending on your back stabbing/stabbed ratio. In either case, I found myself wanting to go back for more. This review is based on a PC code provided by the publisher. Armello is available now for $19.99. The game is rated E10. Game reminds me of Dokapon Kingdom.